The use of the death penalty has had a long and controversial history in the United States. Hundreds of lawsuits have been brought against states and the federal government to challenge the constitutionality of the death sentence and the procedures involved in executions of convicted murderers who receive the death sentence. The United States Supreme Court has ruled numerous times on challenges to the death penalty. Presently, 31 of the 50 states have laws permitting the use of the death penalty. Although there have been nearly 16,000 state-sanctioned executions since colonial times, the number has receded to fewer than 30 each year in recent years. It is expected that there will be less than 20 executions in 2017. During the last 320 years, most death sentences have been carried out via hanging (accounting for nearly 60% of the deaths) or electrocution (nearly 30%). Less common approaches have been via burning, firing squad, and gas. The execution method of choice has shifted slowly as time has progressed. These days the favored method is lethal injection. There have been 1,350 deaths by lethal injection since the 1980s, although that process has encountered legal and logistical impediments in recent years. During this decade, pharmaceutical companies have refused to supply the required drugs to states, and Death Row prisoners have brought numerous lawsuits against states to block the use of drugs for being inhumane. 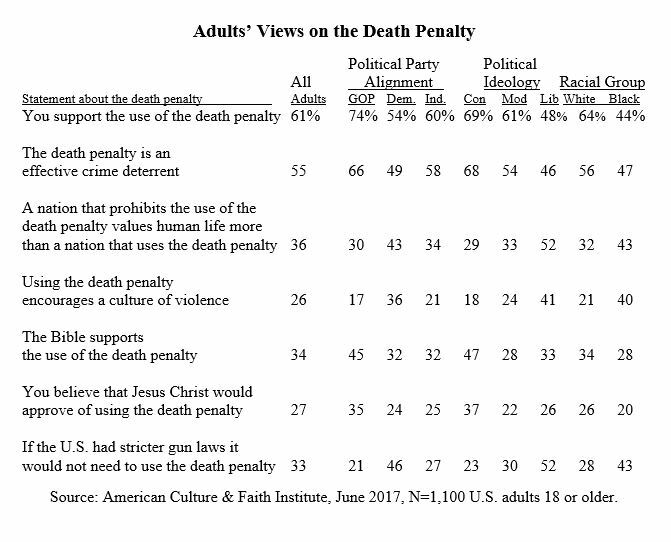 A new national study conducted by the American Culture and Faith Institute reveals that American adults support the use of the death penalty by a three-to-one margin (61% to 21%). The most substantial support comes from Republicans (74%), people from households making more than $100,000 annually (70%), conservatives (69%), people 65 or older (67%), and men (65%). The most widespread opposition comes from blacks, liberals, and Millennials, and Democrats. A small majority of adults (55%) also believes that the death penalty is an effective deterrent against crime. The segments most likely to hold that view are conservatives (68%), Republicans (66%), Hispanics (63%), men (61%), and people who are most actively engaged in their Christian faith. The survey identified three views that are rejected by most adults. Those included the idea that the death penalty encourages a culture of violence (denied by 61%); that stricter gun laws would eliminate the need for the death penalty (a notion opposed by 53%); and a plurality who disagree with the idea that a nation that does not deploy the death penalty attaches higher value to life (47%). When people were asked whether the Bible and Jesus Christ approve of the death penalty, there was widespread confusion. Almost four out of ten adults (38%) admitted that they do not know if the Bible supports the use of the death penalty, while 34% believe it does support it and 28% contend that it does not. The only group for which a majority said the Bible is pro-death penalty were people who regularly listen to Christian radio. When it came to perceptions of Jesus Christ’s views of the death penalty, 41% believed he would oppose it, 27% said He would approve, and one-third (32%) did not know. There was no segment of respondents for which a majority claimed that He would either support or oppose a public execution. The groups most likely to believe He would be opposed included Catholics (50%), Democrats (48%), Hispanics (48%), and born again Christians (45%). According to George Barna, who directed the research through the American Culture & Faith Institute, a series of patterns emerged in relation to views about the death penalty. The views of born again Christians regarding the death penalty typically have a weak relationship to their faith. Specifically, nearly two-thirds of born again Christians (63%) say they support the death penalty. Yet, only two out of every ten of them say they strongly agree that the Bible supports the use of the death penalty and strongly affirm that Jesus Christ would approve of it. In fact, born again adults are more likely to admit to not knowing what the Bible teaches or Jesus would do on this matter than they are to have firm beliefs on these matters. Race is one of the stronger predictors of someone’s views on the death penalty. While whites are among its strongest advocates, blacks are the most consistent opponents of the death penalty. Independent studies have shown that blacks are disproportionately victims of the death penalty, undoubtedly stimulating such opposition. The more Christian media a person is exposed to, the more likely they are to support the death penalty. This issue is highly partisan and ideological in nature. Overall, Democrats and liberals are consistently among the most numerous opponents of the death penalty. In contrast, Republicans and conservatives are typically among the most widespread supporters of it. Independents and moderates fall in-between those two ends of the spectrum. Millennials consistently demonstrated the lowest levels of support for the death penalty among any age group. People 65 or older consistently demonstrated the highest levels of support for it. The research described in this report is drawn from FullView™, a nationwide survey with a randomly-selected sample size of 1,100 adults, age 18 or older, whose demographic profile reflects that of the adult population. The online study was conducted by the American Culture & Faith Institute during June 2017.